HOT $3/1 Tide PODS printable coupon! Amazon: $6.99 Tide PODS 35 ct with BIG $3 coupon! 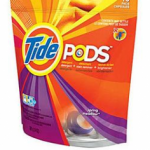 HOT New $3/1 Tide Liquid or Pods printable coupon = deals starting at $1.94! AWESOME New $2/1 Tide PODS printable coupon! HOT – New $3/1 Tide PODS/Gain Flings and $2/1 Tide or Gain Liquid Detergent printable coupons! New high-value $3/1 Tide PODS or Gain Flings printable coupon available! RUN! $2/1 Tide Detergent, $2/1 Gain Detergent and $2/1 Tide PODS or Gain Flings printable coupons! SMOKING HOT New $2/1 & $3/1 Tide & Gain printable coupons = $0.94 CVS Deal & $0.95 Dollar General Deal! New $2/1 Tide PODS and $2/1 Gain Flings printable coupons available! New $2/1 Tide PODS printable coupon available! LOTS of High-Value P&G Coupons at P&G Everyday – $2/1 PODS or Flings (good on small items), $2/1 Tide Detergent, $1/1 Bounty/Charmin and more!